The post Christmas Market Tour of Germany with Kids appeared first on Family Travel Blog - Travel with Kids. Known for water sports, beaches, and nightlife, few who visit Cabarete get to take in the beauty of our backyard- the mountains and rivers. During your stay, take the road less traveled for your Cabarete Excursion: A River Float with Dominican Surf Trips. The excursions offered by Dominican Surf Trips are one of a kind in Cabarete. The tour operator prides itself for keeping it’s locations private so that they remain protected and 100% local. It’s for this reason we love recommending them to our guests. Not only does Dominican Surf Trips offer unique surf excursions available nowhere else, they are the only tour operator that offers the River Flow, undoubtedly the best way to experience the mountains in Cabarete. What is a River Float? In short, you will be floating down a river on inner tubes surrounded by hills and mountains. DST picks you up at Villa Taina driving you to the start location about 30 minutes away. The drive alone is beautiful as it takes you through Dominican neighborhoods where the best of our country’s culture can be observed. At the starting point the group loads up on snacks, drinks, and beverages. Beer, rum, coconut water, local cheese, tropical fruits, munchies, all packed up to enjoy while on the float. What is a River Float like? This Cabarete excursion is unlike the rest because you won’t be wearing a helmet, life vest nor guided along in a conveyor belt like fashion. The River Float does just that, it flows while you float, and all depends on the group and the river that day. Sometimes the float down the river takes two hours sometimes it takes three. Every float begins with choosing your inner tube and cold beverage for the ride. During the excursion you’ll see cows and horses untethered grazing in the grass. The river is fairly shallow and calm in most points although there are three small rapids that breakup the stillness very nicely. You can paddle to the shore and walk back up the river to enjoy the rapids again. There are two stops where those who like to jump from high places can climb up the cliff and launch. Around the middle of the tour, the group stops for snacks at a bank in the river where there is also mud, fantastic for a body mask. The tour ends at a bridge where locals are usually doing backflips off of. Eat a hearty breakfast before the tour. Only snacks are provided. Bring a hat and possibly even long sleeve sun protection, you’ll be directly under the sun for hours. Do not bring any technology unless it is completely waterproof. Wear flip flops or water shoes. Children who aren’t strong swimmers should wear a life vest that you provide. Ask ahead of time if you want photos of your excursion, DST will bring a photographer to capture your day. Book at least 2 days ahead of time, DST will need to scope out the river and conditions before confirming your trip. for more information on booking this Cabarete Excursion. The post Fun Things to Do in Cabarete: River Float appeared first on Better Than a Hotel – Cabarete Palm Beach Condos. Choosing the best business backpack is an important decision, because it can mean the difference between enjoying your time on the road, and having a miserable trip. You need to make sure that your laptop fits, and that the backpack is comfortable and stylish. Luckily, we’ve done the work for you. Keep reading to find our reviews of the best business travel backpacks below. Looking for something specific? Just click the link below to go directly to that section. Check out our comparison chart with all of the options for the best laptop backpack that we’ve reviewed here. Just click on the column headings to compare! There’s a lot to consider when you’re looking for a great business backpack. Just because your boss loves her backpack, doesn’t mean that it’s right for you. You need to take a look at fit, style, and if the backpack will fit you properly. When you’re traveling for business, it’s pretty much guaranteed you’ll be carrying a laptop and charger at all times. On top of that, you may be bringing a portable international WiFi device (we love our little Tep portable WiFi), plenty of chargers, plugs, business cards, and so much more. All of that means you’re going to need pockets, and plenty of them. Above all, you need to make sure that your backpack is big enough to pack all of your gear. If your laptop doesn’t fit in the backpack, it’s time to head back to the drawing board. If a backpack’s too big for your frame, it’ll seem clunky and awkward, not to mention heavy. If it’s too small, you’ll likely find the straps and general fit awkward. I’ve learned the hard way that padding in a business backpack is crucial. I dropped a laptop bag on the floor a couple of years ago, and because it didn’t have good padding on the bottom, my nice new laptop ended up with a good crack on the casing. Luckily, it still works perfectly to this day, but I won’t make that mistake again. Make sure that there’s padding on the bottom of the bag especially, but padding all around the laptop sleeve is a great feature as well. If you’re spending a lot of time outdoors, you may want to make sure your laptop backpack is waterproof, or at least water resistant. Since I carry my laptop and other valuable gear, I like to make sure that my backpack’s as secure as possible. 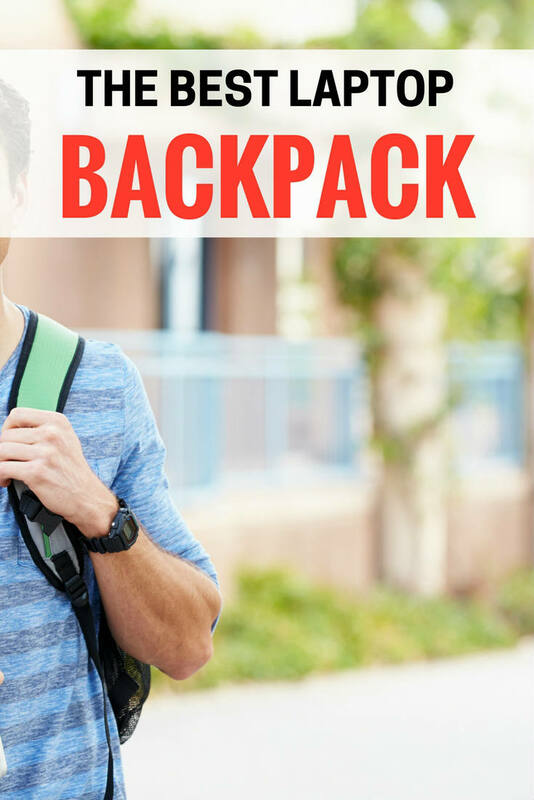 Many backpacks have partially hidden compartments, as well as zippers that are theft proof, and some are made of materials that are hard to cut or slash. Some backpacks even have an RFID pocket to protect your passport and cards from RFID scanners. Adjustable straps. If a backpack doesn’t have adjustable shoulder and waist straps, don’t buy it. Even if it fits you as is, you may want to wear the backpack with a heavy coat someday, and then the straps won’t fit. You might also not be the only one to one day carry it. Padded shoulder straps. A padded shoulder strap means that your sometimes heavy backpack won’t dig painfully into your shoulders. I know that my backpack gets pretty weighed down with my laptop and accessories, so a comfy shoulder trap is important. Padded back. You don’t want so much padding on the back that the backpack gets heavy. A softly padded back can be a blessing when you’re running to catch your flight, and your backpack keeps bumping against your back. Carry strap. Usually a carry strap is a loop at the top of the backpack. It makes it easy to pick up your backpack from the floor. Because you’re using your backpack in a business capacity, you’re going to want a pack that reflects your style. Whether you’re the buttoned down power suit type, or an edgy, creative type, there’s a style that’s suited for you. My favorite backpacks have what’s called a u-zip. This means that you can open them completely on at least two sides, making access easier. I’m not a big fan of top access only backpacks, as I find it hard to find things that have moved to the bottom. For women, the best business laptop pack is one that fits their body, and (hopefully!) also fits all their gear as well. Most (not all) women have shorter bodies and narrower shoulders than men, making a slightly smaller and compact backpack a great choice. We’ve used a Dell backpack for years now, and while it holds a ton, as a woman who’s 5’5″, I find that it’s uncomfortably big and bulky to carry around. I really prefer our new, narrower and more compact eBags Professional Slim Laptop Backpack. I’m definitely a fan of this eBags backpack. It fits me well, and easily holds my monster of a nearly 16″ Lenovo Ideapad laptop in the back compartment. This is a great backpack for someone who wants a professional look, as it also converts to a briefcase when you tuck away the straps. At 18.5 inches high x 12.75 inches wide, it’s plenty small for carry on luggage for most airlines, or even as a personal item. There’s plenty of padding in the back, the Airmesh back panel keeps it from being too sweaty on hot days. The straps are contoured, padded, and fully adjustable, making for a great fit. There’s even a removable front (sternum) strap for heavy loads. 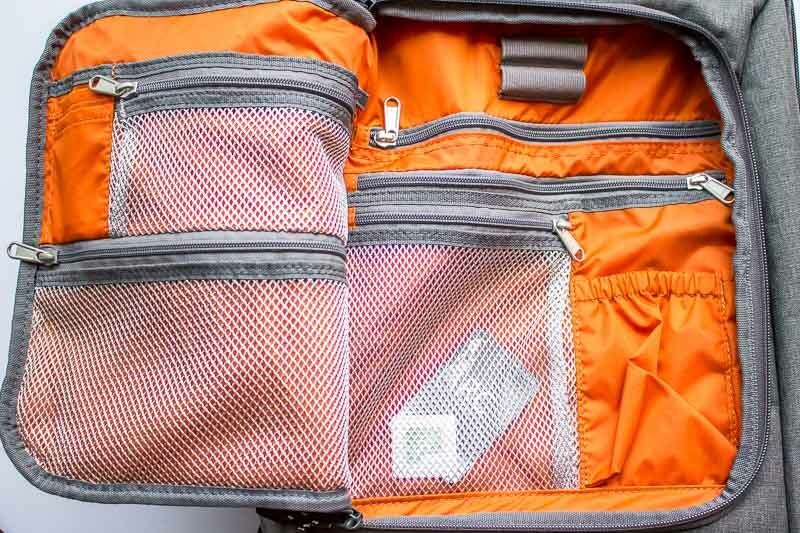 The front compartment is chock full of zippered pockets to hold cables, flash drives, and all your gear. There’s also a limited Lifetime Warranty against defects in materials and workmanship. All compartments have a u-zip, meaning that you can open them up and load from the the top or side. The best men’s business backpack takes into consideration all of the points above, but also takes into a man’s (generally) broader shoulders. My 6 foot husband loves our Dell Adventure Backpack. 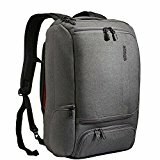 It’s a great laptop backpack and holds a ton but the style is pretty casual and it can get a little uncomfortable when it’s loaded with 40 pounds of electronics. It’s also older and I’m a little afraid it’s running out of stock, so something like the SwissGear Travel Gear 1900 Scansmart TSA Laptop Backpack is a great choice instead. SwissGear products usually get good reviews, and the SwissGear Travel Gear 1900 Scansmart TSA Laptop Backpack is no exception. It’s another more casual choice, and a medium to large size bag, at 9 inches deep, 13.5 inches wide and 18.5 inches high. It fits a 17 inch laptop. This is marketed as a TSA SmartScan backpack with lay-flat technology, which just means that it’s designed to meet the TSA’s criteria to allow a your laptop to stay in the bag during screening. That said, I’ve always had TSA agents ask me to remove my laptop, and they don’t seem especially keen to discuss exceptions. This is made with weather resistant 1200D ballistic polyester. It’s not waterproof, but it should withstand some tough knocks and a bit of rain. The shoulder straps are all adustable and padded, and there’s a padded back panel as well. The main laptop section zips to lay completely flat, making access to your laptop a breeze. All in all, this is a solid, more casual choice, that should last a while. Click for more reviews, the current price, and more. We’ve had our Dell Adventure laptop backpack since 2014, and it’s still going strong. There’s hardly any wear on it, even after 4 years, and it’s traveled with us to at least four continents, carrying a lot of gear each time. The downside is that I find it’s pretty big, and it gets insanely heavy when it’s jammed with all of our gear. Of course, the upside is that it’s so big the we can jam in a crazy amount of gear. It’s definitely a casual look, and ours has a blue accent, but they only offer it in black and orange now. It will fit a laptop with up to a 17 inch screen however we once carried 3 laptops and their power bricks, 2 tablets, 4 eReaders, a DSLR camera in it’s own case, 2 GoPro’s, a couple chargers and a half dozen cables in ours. Needless to say, the bag is a good size at 9 inches deep, 13.7 inches wide, and 18.3 inches tall. There are padded and adjustable shoulder straps, along with a padded, mesh back. There’s no waist strap. Access to all of the compartments is easy, with zippers that open wide. 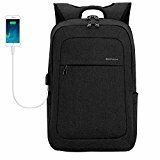 The Amazon Basics laptop backpack is a good size backpack that will hold a 17 inch laptop, and is seven inches deep, fifteen inches wide, and nineteen inches high. If you’re looking for a wide backpack, this is for you, as it’s the widest one in our review. As with all Amazon Basics products, it’s great value for the price, and people seem to really like it. Like all the other backpacks in this review, the shoulder straps are padded, and the back is padded as well. There aren’t any hip straps. There’s nothing fancy here, no specialized waterproofing or security features, but it’s a good value. There’s light padding on the bottom of the laptop pocket. You can get it with, or without, the Amazon logo on the front. For my last few solo trips, I’ve used our top-loading Pacsafe Venturesafe X30 anti-theft adventure backpack. I don’t love the fact that it loads from the top, so it doesn’t make my cut as the absolute best backpack for business travel, but other than that it has some great security features. It has anti-theft Slashguard stainless steel wire mesh embedded into it complete with RFID protection. The Venturesafe X30 is fairly lightweight, has a padded tablet sleeve, with plenty of pockets and locking zippers. It also has a built-in rain cover, an aluminum support back panel, and a stowaway hip belt for adventurous hikes. At roughly 18 inches high and 9 inches wide, it’s small enough to use as either a carry on or even as a personal item with most airlines, and it holds an awful lot. It also has a molded aluminum frame that sits on my body quite well. If you’re really concerned about security while you travel, check out our in depth money belt and neck wallet review here. In terms of security, the Pacsafe is my top backpack for security pick. I’ve had my Pacsafe Venturesafe X30 for well over a year now and I really love it. It’s lightweight, good looking, and has great security features like RFID protection and slashguard fabric. It has a 30 liter capacity, fits a 15 inch laptop, and officially measures in at 7.9 inches deep, 11.8 inches wide and 20.3 inches high. Tip: If you’re looking for something even smaller, Pacsafe sells the Pacsafe VentureSafe X22, which has a 22 liter capacity, and measures in at 4.7 inches deep, 10.6 inches wide and 18.1 inches tall. The big disadvantage to this backpack is that it’s top load only, making it hard to get at gear in the bottom. Of course, being top load only means that it’s also harder for thieves to access your gear. It also has a bit more of a casual look than the eBags professional. That said, I’ve used this backpack on multiple trips now, and it has plenty of room for my laptop, charger, cables and gear, plus my DSLR camera and lenses, my MeFOTO Roadtrip lightweight tripod, plus a GoPro HERO 6 and accessories. See prices and more reviews now. Now that we’ve talked about backpacks that are great for different uses, here are my other picks for the best business travel laptop backpacks. These packs are in addition to the backpacks noted above, and are all solid choices. Along with our eBags slim pick, the Kopack slip business laptop pack is one of the more stylish laptop bags we found. It has a sleek, professional look, and it comes in black, grey, and a nice pinkish purple. It’s on the smaller end, at 7.1 inches deep, 11.8 inches wide, and 17.7 inches high. It will hold a 15.6 inch notebook computer. The fabric is water-resistant, and anti-scratch nylon. It has a dual access zipper with anti-theft design, but no RFID or anti-slash tech. There’s a hidden back waist slot for concealing a credit card or small item. Shoulder straps and the back are padded, and there’s a loop handle on top to make picking it up easier. It has a useful external USB charging port on the outside. Just connect your power bank to it on the inside (check out our favorite external battery pack on Amazon), and connect your USB charging cable to the outside port. No more rummaging in your pack for your spare power bank! 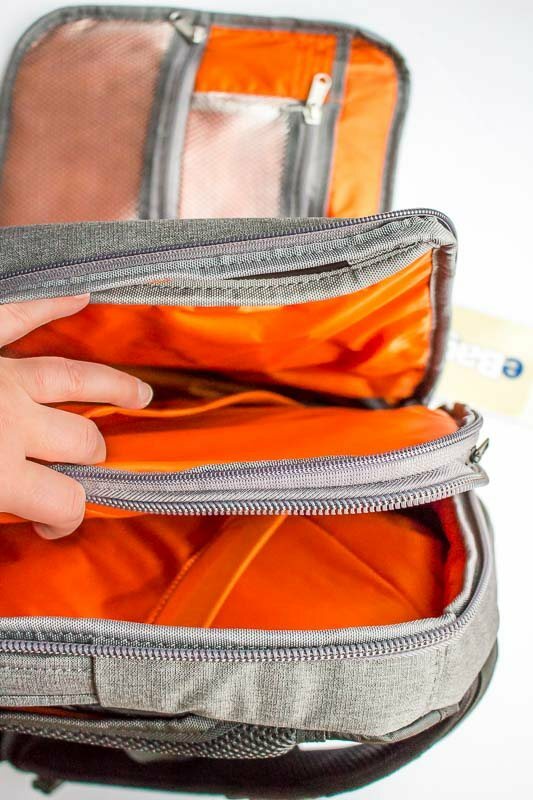 The front pocket has a large, easy access u-design zipper, but the laptop compartment only loads from the top. Unfortunately, there’s no extra padding at the bottom of the laptop compartment, so be careful when placing it down on hard surfaces or pick up an Amazon laptop sleeve to give you extra protection. The Uoobag KT01 is a pretty sleek looking back, in pure black with red accents. It fits a 15.6 inch laptop, and the entire laptop compartment is padded. It measures in at 5.9 inches deep, 13 inches wide, and 18.1 inches high. It weighs in at 2.1 pounds. Tip: If you’re looking for a slightly bigger option, there’s also a 17 inch version that measures 6 inches deep, 12.6 inches wide, and 19.3 inches deep. It won’t fit a thick 15.6 inch gaming laptop. You can find it here on Amazon. The Uoobag KT01 also comes in coffee and a lighter grey color. Safety features include anti-theft dual zippers and a waist pocket. There’s a lockable ring on the side of the laptop compartment. It’s made of 210D water repellent fabric. The Solo Executive 15.6 Inch Premium Leather Laptop is our only leather option that we rated well enough to be included. It’s a sleek, professional looking leather laptop backpack that fits a 15.6 inch laptop, and measures 13 inches wide and 17 inches high. It’s one of your best bets if you’re looking for a polished, professional image. Shoulder straps are padded and adjustable, with a padded laptop compartment. It comes in espresso only. There’s no strong leather smell, and there’s a u-zip to make access to the middle compartment easy. See prices, and more reviews and information here. The 17 inch Targus Drifter II is a solid choice, with a bit more of a casual look. It’s also on the larger end of these choices, and while it is casual, it’s a real workhorse, with the 17 inch version holding a 34 liter capacity. It’s a good size, at 7.87 inches deep, 14.57 inches wide and 20.08 inches high. Be warned, though, it does swell to more than 7.87 inches deep when it’s full! There are approximately 8 million pockets in this backpack. While that’s definitely an exaggeration, there are pockets in this thing for everything from your laptop (of course), to a microfiber lined pouch for sunglasses. Straps are fully adjustable and padded, and the back is also padded for comfort. It doesn’t have a sternum (chest) strap. There are no special security features like RFID or fancy zippers here, but there is a cool secret zipper compartment on the back for hiding keys or your wallet. There’s also no waterproofing on the zippers, and no separate rain cover. It also comes in a 16 inch version, if you’re looking for something slightly smaller. The only issue with this backpack is quite a few reviews that mention straps that start to wear with use. See prices, reviews and more here. See how we manage to travel carry on only for a family of four here, or check out our business travel checklist here. What’s your favorite laptop pack? Let us know, and maybe we can add it to our business backpack reviews! Cancun, found in Mexico’s Mayan Riviera, is an area of beautiful beaches, stunning scenery and is teeming with a range of activities. Over the years, we’ve spent many months in the Yucatan, Cancun’s home state, and have done just about everything there is to do in and around the region. 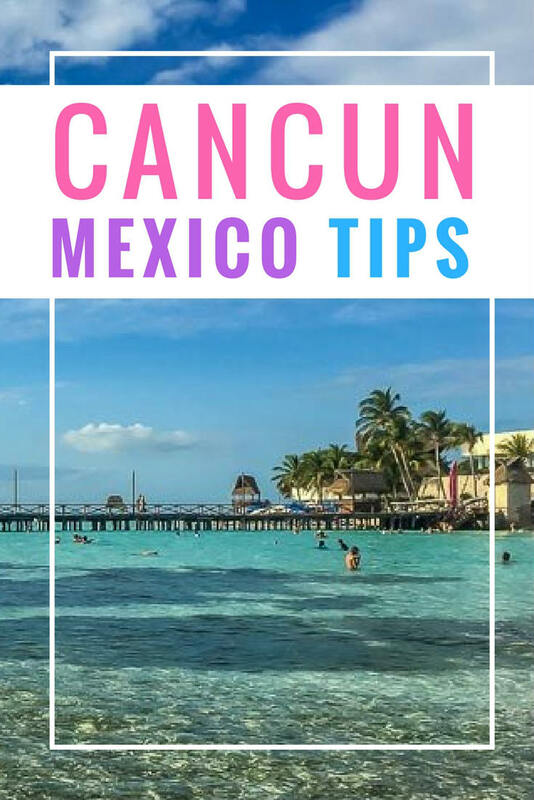 From enjoying the beaches of Cancun with the kids, golf carting around Isla Mujeres, and walking along Quinta Avenida in Playa Del Carmen, to swimming with turtles in Akumal, wandering the ruins down in Tulum, and crossing over to the lovely city of Merida. The list goes on. 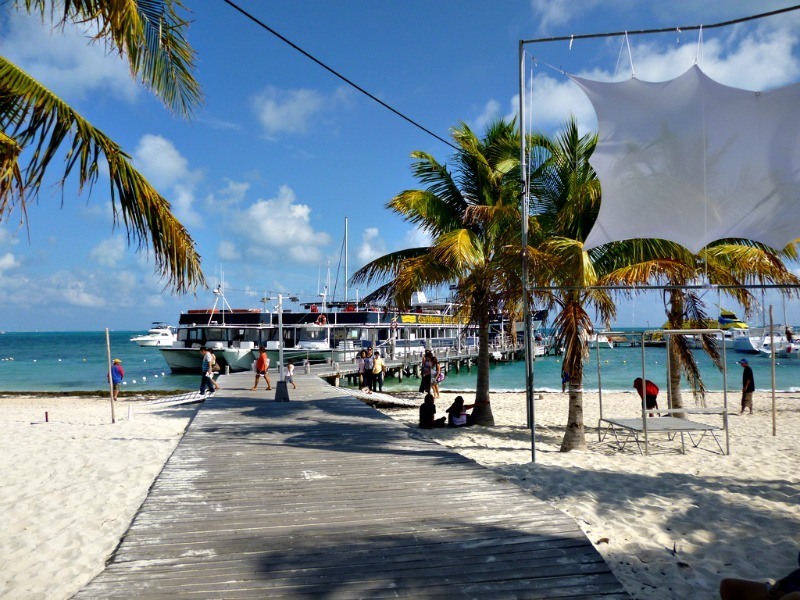 A favourite of ours was when we took a ferry to Cozumel, and a bus then a high-speed ferry to Belize. All of these paradises originating from the Cancun and Playa Del Carmen area. Some of our fondest memories of Cancun include hours spent on the many beaches, mornings exploring nearby cenotes and Mayan ruins with visiting friends, afternoons enjoying snorkeling as a family in underwater wildlife sanctuaries and visiting eco-theme parks. We loved spending evenings watching amazing shows and hanging with the locals on Sundays, and spending warm days in parks and cooler days in malls, as well as going to far flung restaurants all along the coast and even over to Cozumel. We’re even so enamored with Mexico’s beautiful gulf coast that we’ve seriously considered buying property in Mexico on numerous occasions. Once the kids are on their own, Mexico’s Mayan Riviera area will likely be our winter home. We’re also always one click away from chartering a plane to Cancun with Air Charter Service (ACS) anytime we see a hint of snow here in Canada. With all that said, we’ve discovered more than a few of the best things to do in Cancun, Mexico, along with the Mayan Riviera. Let us know which ones are your personal favorites! It might seem obvious, but if you’re visiting Cancun, you’re likely here for the miles and miles of beautiful white sand beach and warm azure waters. 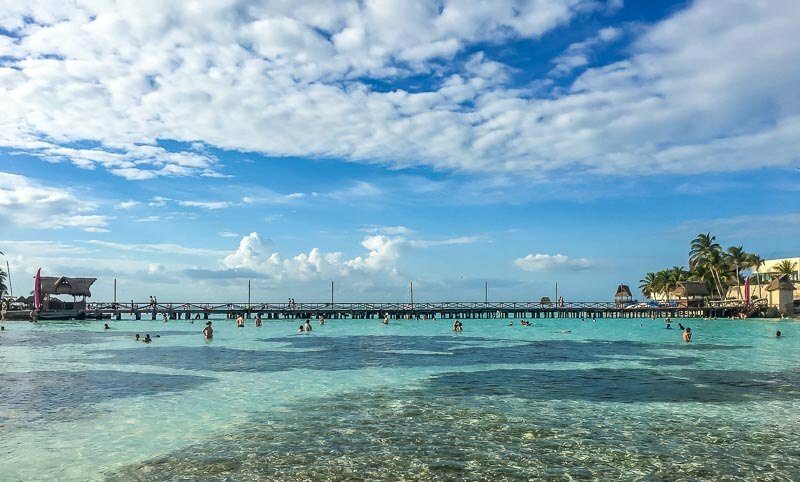 Before all the other once sleepy fishing beaches along the coast followed suit, Cancun was welcoming visitors from all around the world to enjoy its 14 miles of pristine paradise. The most popular beaches in Cancun include Playa Delfines (Dolphin Beach), Playa Forum, Playa Caracol, Playa Chac Mool, Playa Tortuga and Playa Del Nino. Generally, the waves are calmer on the northern side of the hotel zone, and the powder soft sand in Cancun can’t be beat. Playa Delfines is a beautiful spot nestled away from the bustle of the regions many hotels. Around 20 km long, and home to the always busy Cancun sign you see in every other selfie coming out of Cancun, there are also many amenities, water sport rentals and a playground for kids here. Playa Tortuga and Playa Del Nino are two family favorites since they’re on the far northern reach of the hotel strip. Both are protected by Isla Mujeres meaning the water is some of the calmest in Cancun – great for the little ones. Playa Forum, situated at the northeasterly tip of hotel row, is famous for its party scene. While nearby Playa Chac Mool (Chac Mool Beach) has a nice set of free palapas to hide from the afternoon sun. The water at both places can be pretty rough, so make sure to watch the flags and lifeguards are letting people in the water. Playa Caracol, slightly north and around the corner of Playa Forum, is another popular beach in Cancun. There aren’t a lot of amenities, but it’s a great place to stretch out on the public beach. Note: All beaches are public in Mexico so you can walk anywhere along them. However, getting from the street to the water or finding parking can sometimes be a hassle. Most of the beaches in Cancun have hotels with private loungers set up everywhere, however you’re always free to pay for a seat in one of the many beach clubs or just drop a towel anywhere you want to be. They can’t stop you. Cancun is a great jumping off point for deep sea fishing, with tons of options from which to choose. There’s always something biting no matter the season in Cancun, with Atlantic Sailfish, Blue and White Marlins, Grouper, Wahoo, Tuna and Red Snapfish all calling the waters around Cancun home. If you’re interested in deep sea fishing in Cancun, check out this handy chart to let you know which fish is in season. The closest of Cancun’s neighboring islands, Isla Mujeres is only a 15 minute ferry ride away, but it feels like another world with its roads filled with golf carts, smaller beaches and quaint eateries strewn about the island. Journey to Isla Mujeres in the morning, rent a golf cart and drive the entire length of the island checking out the turtle sanctuary, Mayan ruins, some of the nicest ocean side cliffs in Mexico, as well as some unique snorkeling. Or experience the islands exhilarating zip line and watercraft that circles the island to gain a unique and fun view. 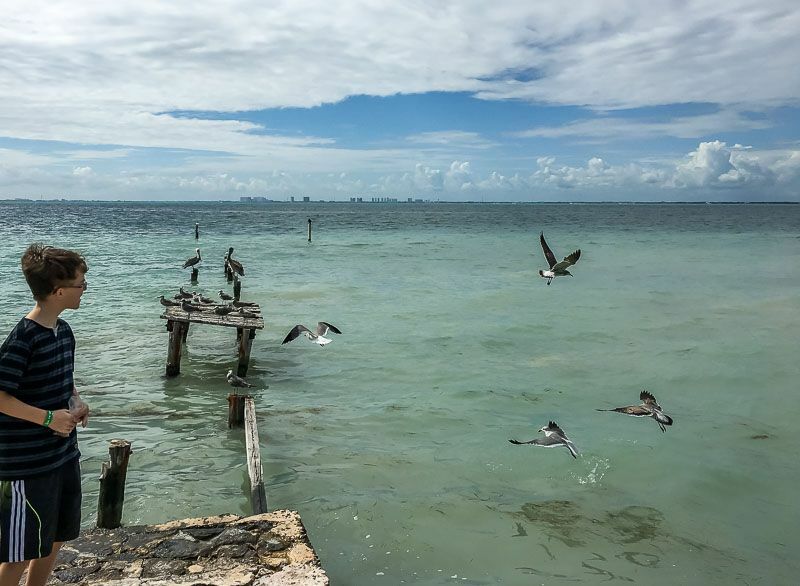 You can check out this post we wrote on Isla Mujeres for more hints on what to do once you get there. With Cancun’s gorgeous temperatures, why would you want to hit a mall? Well, besides for the occasional rainy day, and when that sunburn takes hold and you just can’t handle another hour in the sun, Cancun is accustomed to its global visitors boasting a ton of international shops to accommodate them. As well as high end malls like Plaza Las Americas, La Isla Shopping Village and Luxury Avenue Cancun, there are outlet malls like Las Plazas Outlet Cancun, as well as handicraft stores like Ambarte, that feature gorgeous locally made hand crafted items. For the thrifty, or those looking for unusual finds, there are also plenty of flea markets and local handicraft markets all around Cancun. Want to get away from the beaches but love being in the water? Cancun offers snorkeling and scuba diving trips right from the town centre. Most head out towards Isla Mujeres while some go south towards Playa del Carmen. With warm clear blue waters, it’s easy to spot fish and coral. If you want something a little different, consider going scuba diving to the MUSA Underwater Sculpture Museum in Isla Mujeres. This is the largest underwater museum in the world, and seeing fish and coral make their homes among the hundreds of works of art is a once in a lifetime opportunity. Prefer the water topside? There are plenty of ways to get out on the ocean that don’t involve getting your feet wet. Taking a catamaran cruise is one idea. There are plenty of boats to choose from family friendly boats to party boats. There’s even a pirate cruise featuring a live action pirate adventure. Most Cancun boat cruises include meals and alcohol so it’s up to you to decide if the party booze cruise, the family cruise or if a always romantic sunset cruise is more your speed. Love to party? Cancun is generally regarded as the party capital of the Mayan Riviera and as such it has a thriving night scene. From wild shows and antics at Cancun’s Coco Bongo’s to early morning nachos and cervezas at Carlos and Charlie’s there’s surely something in Cancun for the night time party animal. Cancun really gets wild during college Spring Break so if madness and mayhem are your thing, then book accordingly. Catamaran not fast enough for you? Then maybe you want to rent a jet boat in Cancun and go on a jungle expedition. There are several companies in Cancun that rent two seater speed boats and take you on a follow the guide, hold onto your hat and ride with mad dashes through mangrove lagoons and rivers. You’ll also get a chance to snorkel along a gorgeous coral reef. We haven’t done this one yet, but rest assured it is on our list. 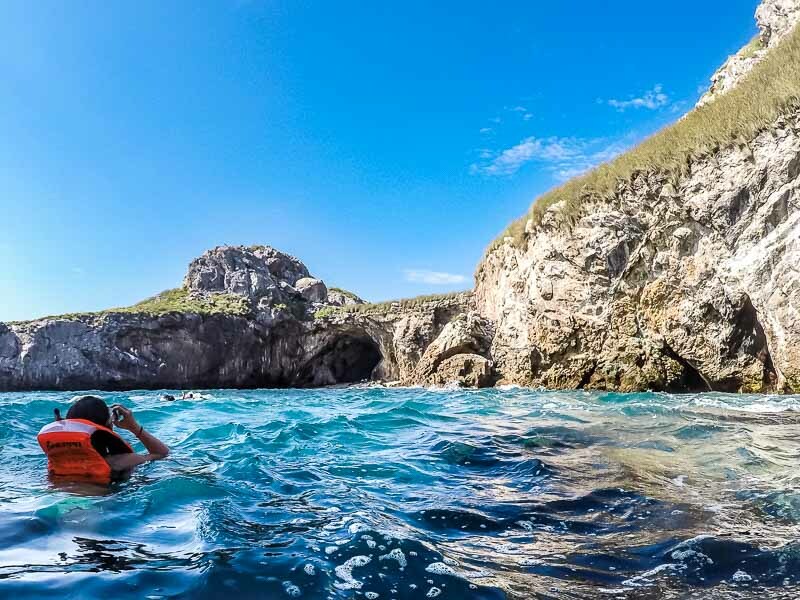 With so much happening all along the Mayan Riviera, limiting yourself to just staying in Cancun will mean you’re missing some of the best things to do on this side of Mexico. 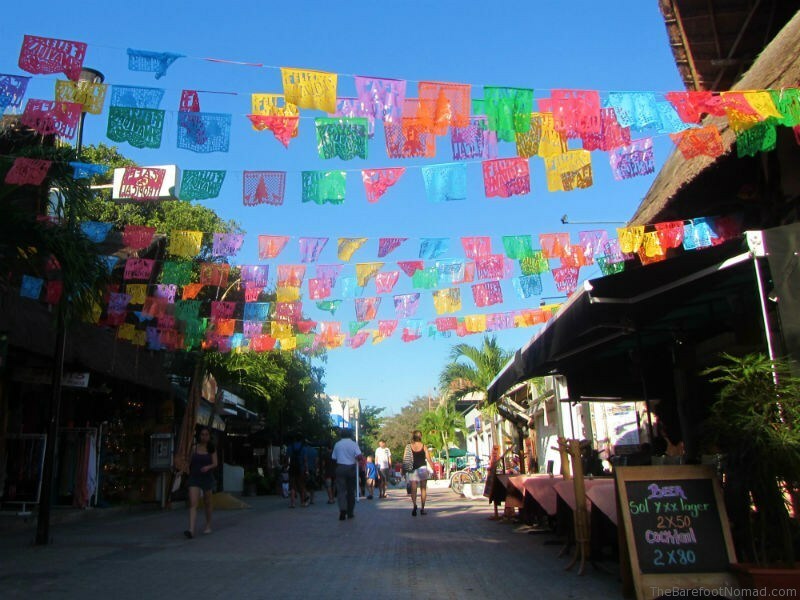 Playa del Carmen is only a forty minute drive from Cancun and even Tulum can be easily reached for a day trip. Of course, you have the pyramids of Chichen Itza, the island of Cozumel, swimming with turtles down in Akumal and dozens of cenotes within easy reach of Cancun as well. If you like the comfort of knowing when you’re starting and when you’re returning on your excursions, there are hundreds of day tours available that will get you to where you want to be and save you the hassle of figuring it all out for yourself. If you want to jump on one of the nice long distance buses or even one of the ridiculously cheap local buses, you can do that too. We’ve also rented cars to tour the peninsula and have taken both collectivos (local mini buses) as well as taxis on many occasions. Just hanging with the locals in Playa Del Carmen (read about our love for Playa Del Carmen here). 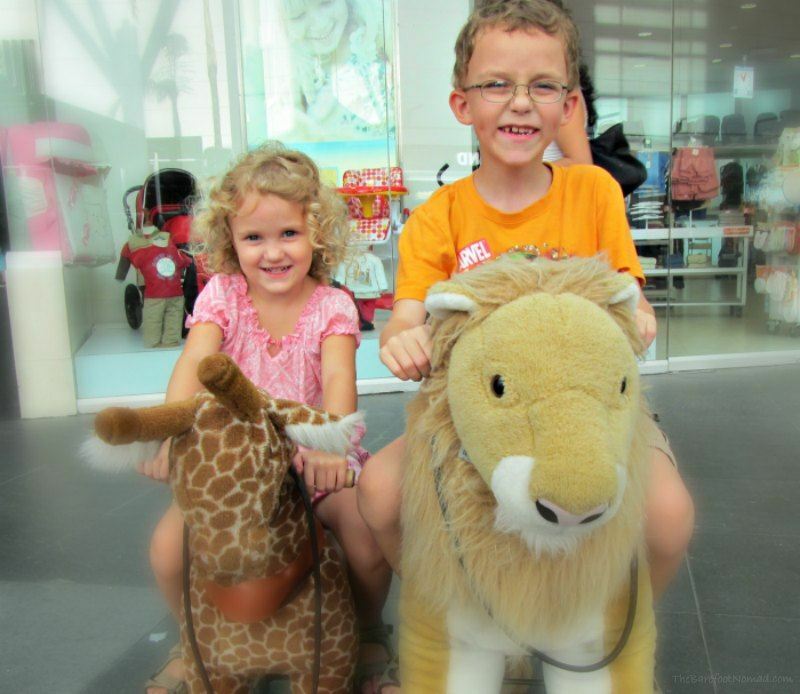 Have kids with you and looking for things to do in Cancun with kids? 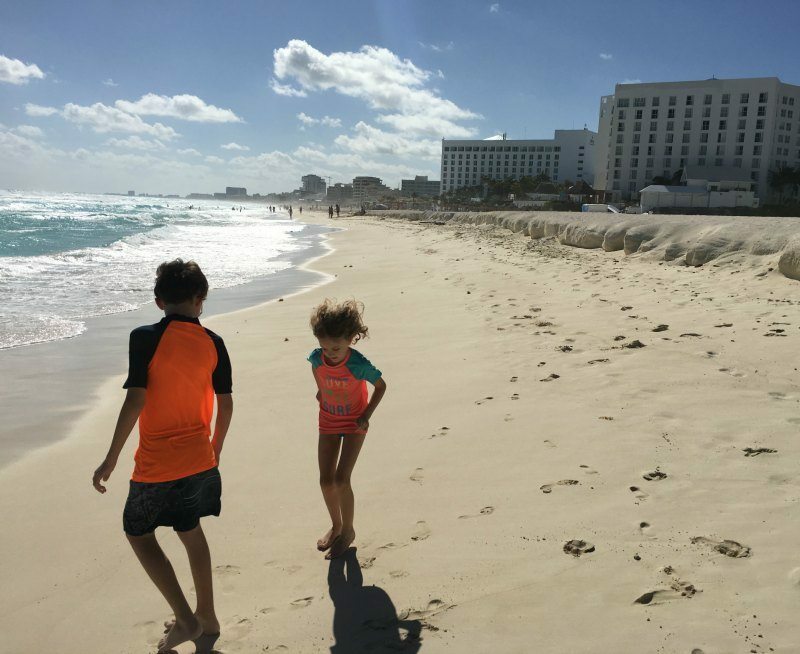 Check out this post we wrote about things to do in Cancun with kids. Have we missed anything? If you think there should be something added to our list of things to do in Cancun Mexico please let us know in the comments. Cabarete is a water sports wonderland where you can kiteboard, windsurf, scuba dive, paddle board, jump off waterfalls, and surf. One local business we want to spotlight is Chino Surf School Cabarete, located in Playa Encuentro, the surf district of our town. Find out about the history of the beach and services offered at the school. When you ask the pioneers of surf in Dominican Republic about Playa Encuentro they’ll tell you about the times they had to walk with their boards through fields and trees to get to the beach. In the 90’s the first roads down to the surf were made, not paved. A trek that 40 years ago may have taken an hour or more is now just a 10 minute walk from the main road thanks to people who believed in dominican surf. Dominican surfers have been frequenting Encuentro Beach since the first surfboards found their way to Dominican Republic. Known to have the best and most consistent waves in the country, Playa Encuentro has always been a favorite. There was a huge tourism boom in Cabarete when it gained popularity as a windsurf destination in the 90’s. As kiteboarding came on the scene more and more businesses catering to tourists developed. Although not yet recognized as a premiere surf destination, Playa Encuentro started to develop and a couple schools were opened on the beach. One of which was Chino Surf School, opened by Chino himself, originally from Santo Domingo. Since it first opened in 2002 with just one other school on the beach, there are now eight surf schools at Playa Encuentro. More than half of these schools are locally owned by Dominicans. This is due to a commitment our local surf community has to keep Encuentro Beach close to its roots. Chino’s Surf School has been an integral part of the growth of surf in the country. Not only has the staff at the school always been 100% local, but they have also sponsored lots of kids. Ways a surf school can help youth in the community is by teaching them how to surf, providing boards, coaching, and essentially just creating an opportunity. Another way is by putting on competitions. Chino’s has been a main sponsor for the Encuentro Surf Classic, the biggest surf competition in Dominican Republic, every year since it started. What makes Chino’s unique is they offer surf lessons and surf coaching for all levels. Their head coach Heriberto Tinoco has coached national teams, pro surfers, and sponsored free surfers for over 30 years. For advanced surfers he uses video playback to improve skills. Intermediate and beginner surfers are coached both in and out of the water. The school also offers group packages, surf trips, and board rentals for all ages and all levels. Surfing is a perfect family activity. Learn more about it in our related post. The post Local Business Spotlight: Chino Surf School Cabarete appeared first on Better Than a Hotel – Cabarete Palm Beach Condos. Can I Buy Travel Insurance If Im Already Abroad? Already overseas and forgot to buy travel insurance before you left? 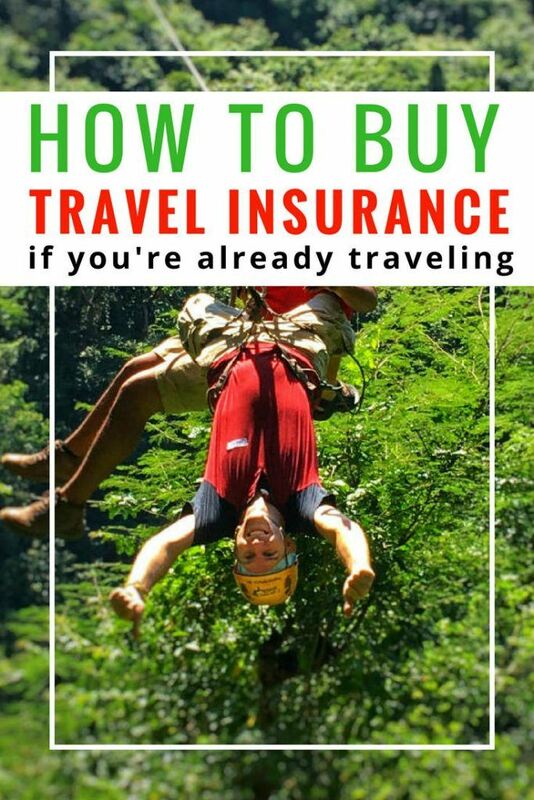 Has your travel insurance run out while you’re on vacation and you want to extend your stay or, heading to an area where it might be a really, really good idea to have travel insurance and you never bothered to buy any before? No matter the reason, buying travel insurance while you’re already abroad happens a lot more often than you’d think. If you find yourself without travel insurance, and you’re already on the open road, don’t worry, we have the solution. What could possibly go wrong? 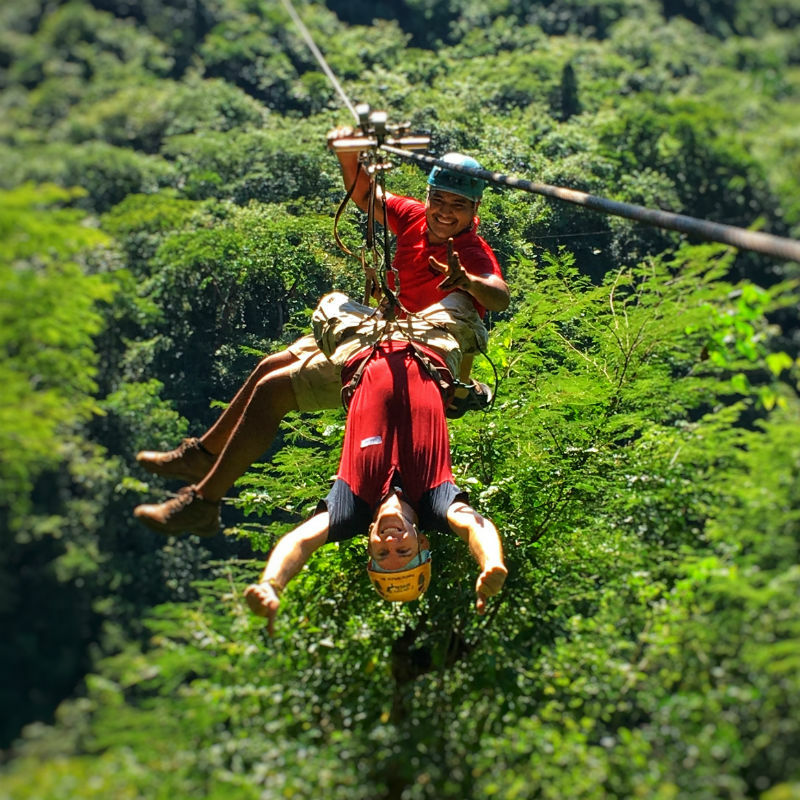 Charles zip lining in the Riviera Nayarit. Whether you’re a classic procrastinator and forgot, or if your travel plans have changed: the good news is you can probably get travel insurance coverage for the remainder of your trip. Even better, the coverage you get will likely be similar to a policy you’d have purchased before you left. This is important: No matter which policy you buy, you won’t be covered for injuries or accidents that happened before you buy your policy. So waiting until you’re on the way to the hospital isn’t the best time to buy travel insurance. Can I buy travel insurance if I’m already abroad? Another important note is that not all travel insurance companies offer travel insurance if you’re already out of the country. In fact, the majority of them require that you haven’t already left on your trip. That said, there are some companies that let you get travel insurance after departure. Some insurers have a waiting period before coverage starts, which is usually just a few days, before your travel insurance coverage takes effect. This is more common for Australian and New Zealand companies, but we’ve also heard it happens with Canadian, UK and US companies. If you get sick or have an accident during this waiting period, you likely won’t be covered. Insurance companies add this waiting period to protect themselves from fraud from people who’ve gotten sick or injured, and then buy insurance to cover the now existing injury or illness. That said, check your policy because some insurers have a waiting period, but they’ll also cover you for emergency overseas medical expenses and emergency transport expenses for a sudden illness or serious injury that results from an accident during that waiting period. Every travel insurance company handles the waiting period differently, so talk with your travel insurance agent to see what they do and don’t cover during this waiting period. 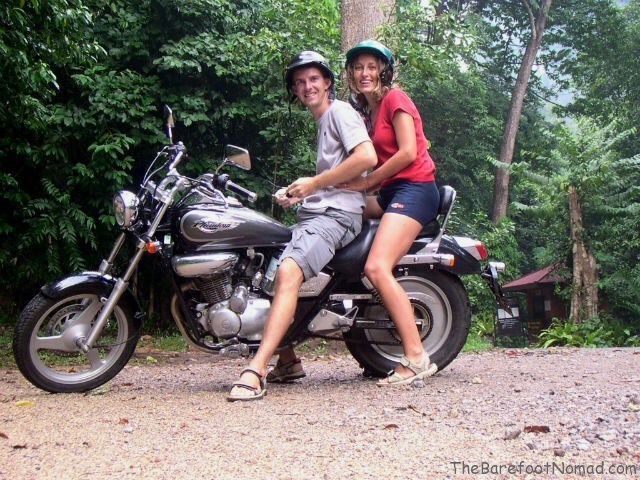 Cruising around Thailand on a motorcycle. That was probably an accident waiting to happen. Just like regular travel insurance, the costs and what’s covered under your policy will vary a lot for travel insurance if you’re already overseas. The exact eligibility requirements, and cover you get, will depend on the specific insurer you choose. Talk to an insurance agent to make sure you’re covered for every activity you plan on doing while you travel. 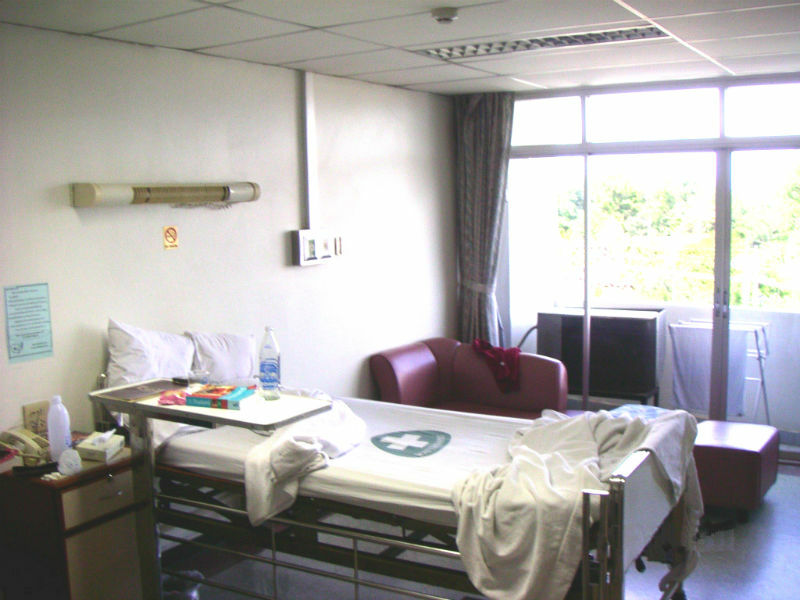 Micki’s hospital room in Trang Thailand, way back in 2003 – our first brush with needing travel insurance. Depending on the travel insurance company you choose, age limits may apply. This is common for both standard travel insurance, as well as health insurance you buy when already on a trip. There are some travel insurance policies with no age limit, but some insurance policies have age limits as low as under 60 years of age. Read the fine print to make sure you qualify. Just like standard travel insurance, depending on the plan you choose, you may also not be covered for pre-existing medical conditions. Of course this depends on your policy, as some travel insurance policies do cover some pre-existing medical conditions like stable high blood pressure. It’s very important that no matter whether you’re buying your travel insurance before you leave or while you’re already on the road, to always tell your travel insurer about any pre-existing medical conditions when you buy your policy. Otherwise, you might be surprised when you submit your bills that they’re declined. If you’re over the age of 60, pre-existing conditions get more common, and also more complex. We get a lot of questions from Canadian seniors heading south in the winter (called snowbirds) about pre-existing conditions and travel insurance. However, any good snowbird travel insurance coverage should include pre-existing conditions – just be sure to check your policy to make sure that you’re covered. Tip: Always check your travel insurance policy to know exactly what your coverage offers, and if there are any exemptions. At the end of the day, your policy is your contract and generally supersedes everything else. Unfortunately, you likely won’t be able to get trip cancellation or interruption insurance if you’ve already left on your trip. This coverage will reimburse you if you need to cancel or end your trip ahead of time. Of course, each insurer is different, buy many travel insurers don’t offer you a cooling off period if you buy travel insurance once you’ve already left your home country. Instead, these policies are typically non-refundable. If you have any doubt, check your own policy to make sure. 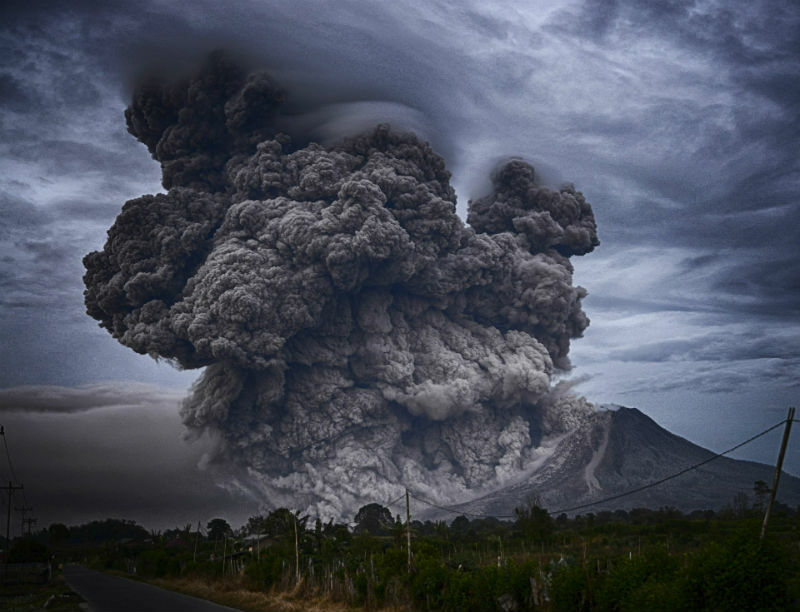 Have you ever wondered “do I need travel insurance“? If you’re a Canadian, and looking for travel insurance, check out our Canadian travel insurance review. Have you bought travel insurance whilst already abroad? Let us know in the comments – we’d love to hear from you!